Hopefully all this extra magic makes CowLARP go more smoothly for poor Enerin. 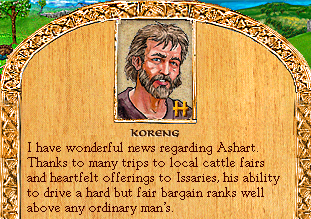 Ashart became a Heroic bargainer at some point, which means he'll be slightly better at buying us all the treasures in Dragon Pass. Do the end game you bum! Unrest between the tribes has been growing for some time. Border disputes have erupted into fighting. Cattle raids have turned into full-pitched battles. Now it seems that war has broken out. Voskandora, a trader of your clan, reports the loss of her trade goods during a battle between the Malani and Kheldon tribes. The Malani ambushed the Kheldon forces as part of an ongoing dispute over control of trade. Sarotar, king of the Malani, seeks to crush the Kheldon by threatening traders who deal with his rivals. Lhankpent, king of the Kheldon, promises to annihilate Sarotar and his tribe. The result of this is that everyone who profits from trade is harmed - Voskandora's loss of your clan's goods is a prime example. -Demand compensation from Lhankpent, king of the Kheldon. -Demand compensation from Sarota, king of the Malani. 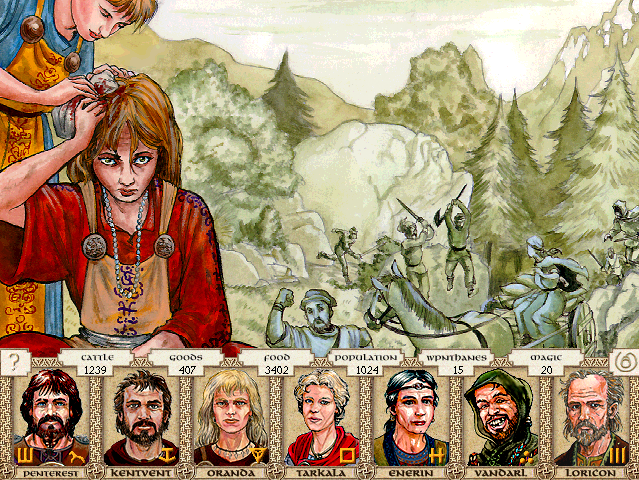 -Offer to broker peace between the warring tribes. -Sacrifice to Issaries to protect trade. 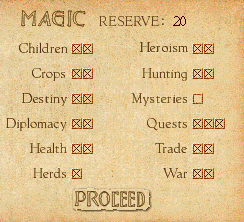 Oddly enough, I have not heard that the Horse-Spawn are taking advantage of these upheavals. Maybe their new ruler has a hand in that. We should do something, I suppose. It is bad enough to lose goods, but the worst harm is the loss of future trade. Only peace can rebuild those opportunities. Will this affect our beer supply? Each king is equally at fault, and you can bet that neither will admit it.